Online strategy will depend on your vision and planning. 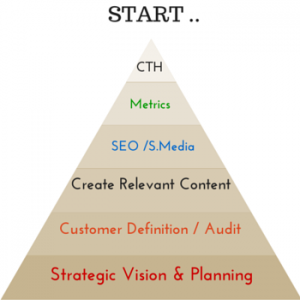 Why is online marketing strategy planning necessary? A web strategy is based on detailed planning, clear vision and common sense. To build a winning online presence you’ll need to consider medium long term resources and processes. This will help you develop and align your overall business strategic positioning. If your digital marketing approach consists of a website, a social media platform, affiliations and a fancy budget for Search Engine Optimization (SEO), then you are not taking the online consumers seriously. Looking to start a online strategy project? The first and far most important step is: to understand that your online marketing strategy is part of your overall business plan. If you’re running a business download and assess your website to see your strategic positioning. Our online strategy roadmap will help you align your business aspirations, goals and short-medium terms objectives. We offer a well crafted roadmap that is vital for any “integrated digital marketing strategy program” to succeed. We will work it from the ground up so you will get to see a comprehensive (step-by-step) and effective strategic planning. Which online platform web responsive, Web 3.0.. The above digital communication plan matrix example shows all the phases to include initial goals summary as well as actual status with latest comments on all project actions. how to analyse, create or/and organise the content of your pages, read market and competitor’s trends, content positioning and social media marketing management to help you stay focus on medium to long-term objectives.